This Week In Pennsylvania Archaeology takes us to Schuylkill County located in the mountainous region of east-central Pennsylvania. Schuylkill County was established in 1811 from lands claimed by the bordering counties of Berks, Northampton and Northumberland. It was named after the Schuylkill River. This is the major drainage through the county and it eventually flows into the Delaware River at Philadelphia. The county is also drained by the Swatara and Mahanoy creeks that flow southwestward into the Susquehanna drainage. Schuylkill County falls within the “Anthracite Uplands” and the “Blue Mountain” Sections of the Ridge and Valley Province. 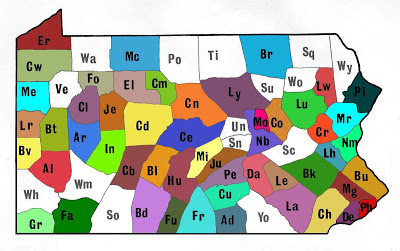 The physical landforms are characterized by hilly uplands and steep mountains ridges with narrow to broad valleys typical to the general configuration of the Ridge and Valley Province in east-central Pennsylvania Geologically, Schuylkill County is made up of coal and shale deposits that and Pennsylvanian and Devonian in age (400 – 300 mya). These are the product of lush bogs and swamps that eventually transformed into the anthracite coal beds of today. Some of the most magnificent plant fossils in the Commonwealth have been found here. 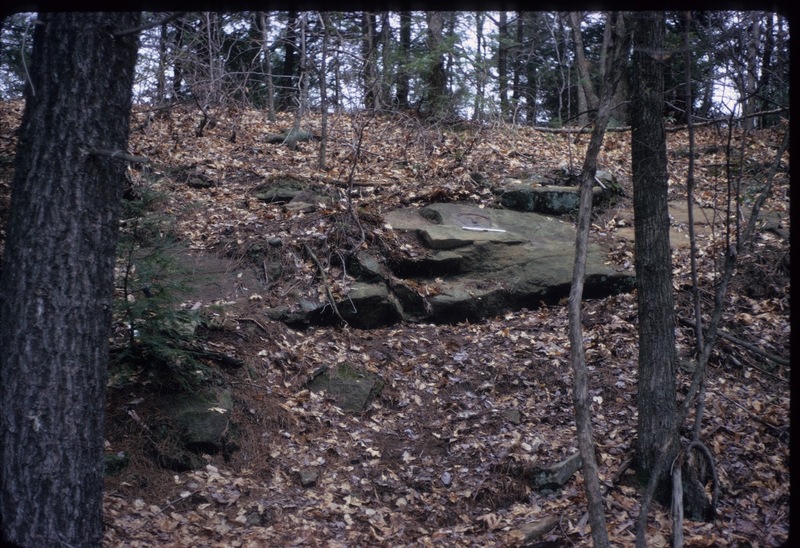 The ridge tops all around the County are capped with a quartz pebble sandstone called Pottsville conglomerate, named after the town of Pottsville, Schuylkill County. 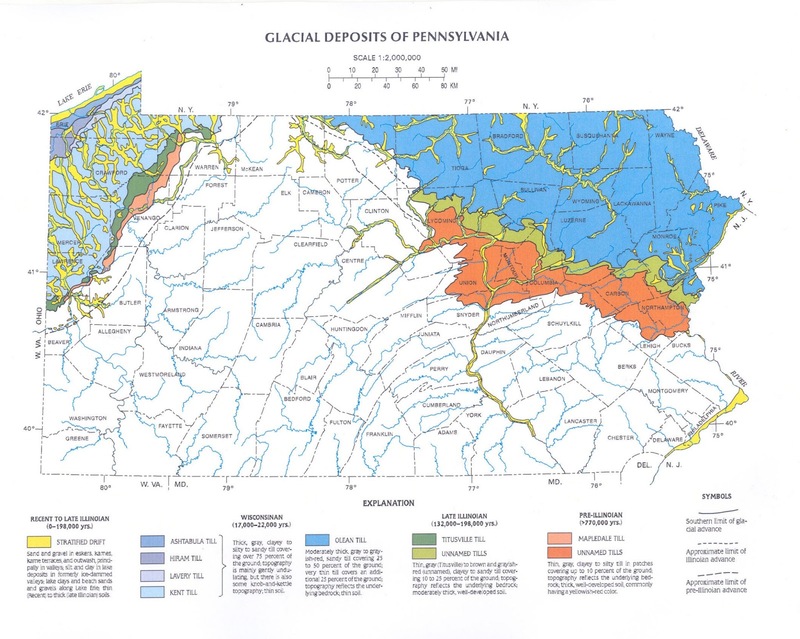 During the earliest stages of the Pleistocene Period the northeastern edge of Schuylkill County experienced some level of glacial activity. At Tamaqua and other locations along and bordering the Schuylkill River, till deposits of Pre-Illinoian age (greater than 770,000 years) consisting of clayey to silty till and rounded cobbles have been mapped by the Pennsylvania Geologic Survey. These ancient soil and gravel deposits form a 10-30 mile wide band that extends from Lycoming County to the Pennsylvania New Jersey border in Northampton County on the Delaware. Two Indian paths ran through Schuylkill County, the Nanticoke and Tulpehocken. 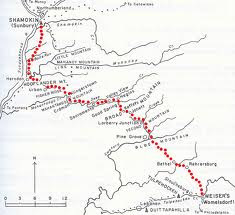 During the 18th century, and likely before and after that time, these paths were direct inter-montane routes connecting other paths to and from the Susquehanna and Delaware river valleys (Wallace 1971). There were no major Indian towns established along these routes but stopover camps or “sleeping places” would have been common and used at certain times by Native Americans and Colonials, alike. A review of the Pennsylvania Archaeological Site Survey (P.A.S.S.) records identify 85 prehistoric and historic period sites in Schuylkill County. The majority of these sites are attributed to eight prehistoric periods with the Late Archaic accounting for most. Transitional Period sites are followed by Middle Archaic Period sites. Paleoindian, Early Archaic, Early Woodland and Late Woodland sites are few in number and with the exception of Paleoindian and Late Woodland sites where projectile point types are very diagnostic, some of these sites may be misrepresented by the generic stemmed and notched styles common to some of these cultural periods. This typology dilemma becomes a real problem that archaeologists encounter when attempting to identify site occupations where radiocarbon dating and other forms of cross dating artifacts cannot be accomplished. The prehistoric use of quartzite, and jasper and chert reflect the availability of such lithic sources in and surrounding Schuylkill County. The Hardyston Formation in the adjacent Reading Prong Section southeast of the county, in particular, is the principal source for quartzite and jasper. Reported Historic Period sites are largely 19th century in age and include farmsteads, industrial and transportation related sites. Most of these sites were registered with PASS in the course of conducting cultural resource surveys for roads and bridges. The PASS files list site occupations as more-or-less evenly divided between the uplands and valley floor settings. This statistic is likely biased since there is more farming activity going on in the lowlands and hence it is generally in those areas where on-ground surface surveys can be undertaken. At the onset of the French and Indian War, a string of log forts was established along the south slope of Blue Mountain (Hunter 1960). These forts was essentially the first line of defense against marauding Indians sympathetic to the French cause in western Pennsylvania from 1754-1763. Some of these were re- supplied and garrisoned during Pontiac’s short lived rebellion in 1763. 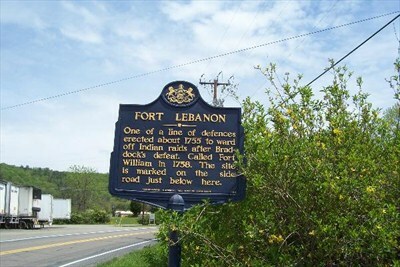 Two of the forts forming the line of defense in Schuylkill County were forts Franklin and Lebanon, the latter renamed Fort William in 1757. As with many of the log forts of the day neither was of substantial design or construction. Fort William referred to by Ben Franklin as “Fort Lebanon in the Forks of the Schuylkill” (Hunter 1960) consisted of a barracks and storehouse and two structures to harbor local settlers in dreaded times of siege. All of this was protected by a 100 foot square log fort. History places the fort near Auburn, a small rural community in southeastern Schuylkill County. The other fort, Fort Franklin was built near present day Snyders, a town in eastern Schuylkill County. It was the smallest fort of the line of defense on the north side of Blue Mountain. Measuring only forty feet on a side, the log fort had two opposing bastions that also served as dual defensive facilities. A third structure is thought to have occupied the main courtyard. 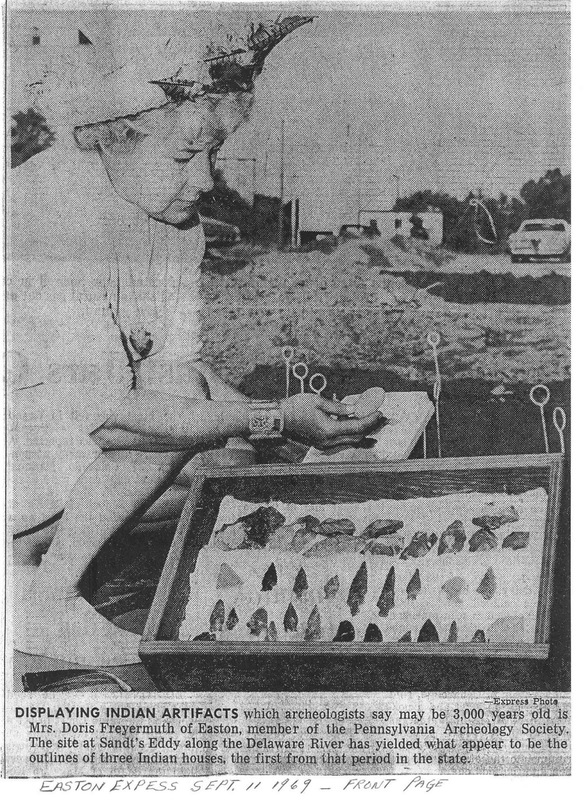 In 1984, through the generous cooperation of Mrs. Curtis Bailey, Stephen Warfel from the State Museum and a staff of over 100 volunteers from the local area undertook a ten day systematic survey and test excavation project to identify the remains of Fort Franklin. Over the course of that period a preselected area of the property measuring 200 feet by 300 feet was investigated. In spite of not finding the fort nor any artifacts relating to the fort the exercise provided participants with the opportunity to learn proper methods and field techniques that are used by professionals to find and excavate archaeological sites. The following year Barbara Lu, a student at Franklin and Marshall College, conducted a magnetometry survey of the area. The Bailey property was again tested along with the adjacent Stahler property. This state of the art methodology discriminates between low and high magnetic responses. This methodology serves two practical purposes: 1) it allows for a large area to be surveyed in a smaller period of time and 2) it is a nondestructive procedure. What it finds, it records on the computer screen as a configured archaeo-magnetic signature or the shape of the anomaly that it scans, such as the wall trench of the fort. Identified anomalies are then targeted and investigated at a later date to confirm the magnetometry data. Although some anomalies were identified in the ground, none were deemed of the sort that potentially marked the location of the fort site or any of its expected features i.e. water well, interior buildings, bastions etc. Over the years many fascinating discoveries have been made in Schuylkill County. Nearly a half century ago, Francis Burke, a local amateur archaeologist from Mar Lin, Pennsylvania discovered a rock carving or petroglyph. His discovery, made on the surface of a sandstone outcrop, was a human face carved in base relief. Mr. Burke wanting to preserve the petroglyph contacted staff archaeologists at the State Museum who moved the carving to Harrisburg where it now safely resides in a climate controlled environment where it can be enjoyed by everyone. 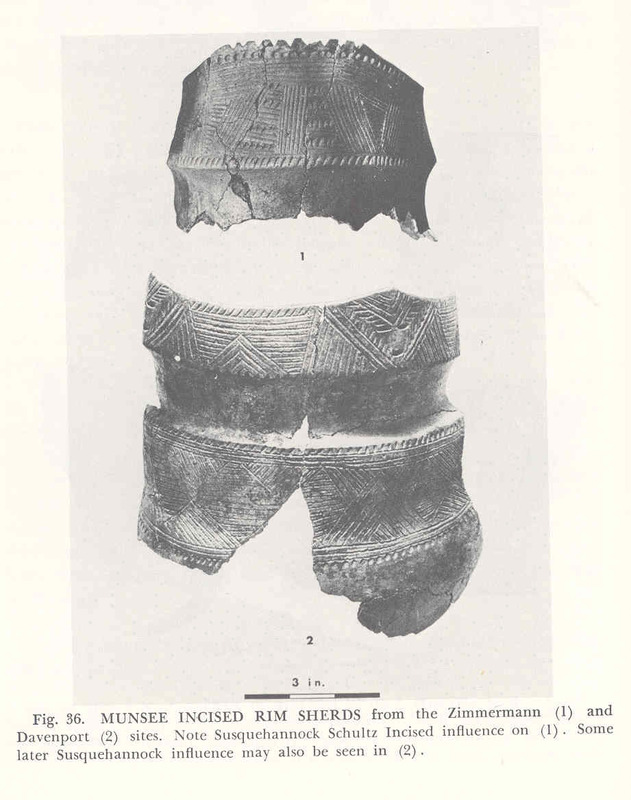 We hope you have enjoyed this brief introduction to Schuylkill County archaeology. Please join us next week when TWIPA will be featuring Snyder County, Pennsylvania. 1960 Forts on the Pennsylvania Frontier, 1753-1758. Pennsylvania Historical and Museum Commission. 1985 Use of Magnetic Survey to Locate the Site of Fort Franklin. Unpublished manuscript in the Section of Archaeology files, The State Museum of Pennsylvania. 1971 Indian Paths of Pennsylvania. Publication of the Pennsylvania Historical and Museum Commission. This week we resume our travels through the archaeological heritage of Pennsylvania and journey to the northern region of the state to Potter County. Often refered to as "God's Country", this county is located in the north central region of the state along the border of New York State in the Appalachian Plateaus Province. This region is characterized by narrow, often steep-sided valleys cut into the rolling plateau surface. The headwaters of the Susquehanna and Allegheny Rivers originate in this rugged and beautiful section of the Allegheny Mountains. Major tributaries include Mill and Sinnemahoning creeks and flowing to the north, the Genesee River. Most of the county is considered as mountainous upland terrain; interestingly the distribution of archaeological sites is almost evenly divided between riverine and upland settings. The effects of Wisconsinan glaciation are evident in alluvial deposition in the Allegheny, and its tributary valleys created by downstream ice-damming of the Allegheny River and the movement of large quantities of soil and rock downslope attributable to glacier change. The Wisconsin glaciation was so named because deposits from its glacier were first discovered, described, and named in the state of Wisconsin. Radiocarbon dating of material from above and below the deposits of sediment left by the late Wisconsinan glacier, scientists have firmly established that in the United States the late Wisconsinan glaciation occurred between about 25,000 and 12,000 years ago. Local testing indicates that the ice was in Pennsylvania between about 22,000 and 17,000 years ago, reaching its maximum extent about 20,000 years ago. The glacier ran along the northwest corner of Potter County then southeasterly to Pine Creek on its eastern border- basically the northern third of the county. The stripping and redepositing of soils from glacial activity exposed bedrock of the Catskill formation at or near its surface throughout much of the county. This formation consists of sandstone, siltsone and shale with much of the soil classified by the Dept. of Agriculture as acidic soils. 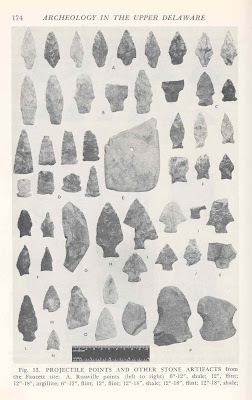 The glacially deposited gravels, pebbles and cobbles of jasper and chert- were utilized for tool production as evident in the archaeological record. Much of the region is forested in maple-beech-birch with some oak and hemlock. This is a second to third growth forest- much different than the ‘black forest” recorded by settlers in the 1800’s. This mountainous terrain with its dense tree cover is likely a factor in the low number of recorded sites in the county, but also the cold temperatures factor during the short growing season for certain food sources utilized by native peoples. This would have been especially true prior to the development of agriculture when such foods as nuts and berries were most important. 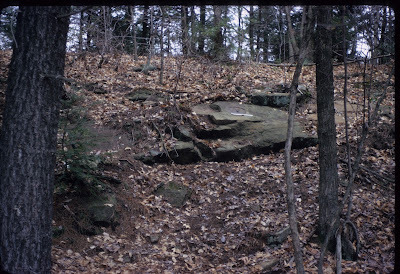 The Pennsylvania Archaeological Site Survey file (PASS) lists one Paleoindian site on a terrace above Twelve Mile Creek which was recorded based on artifact information provided by a private collector. 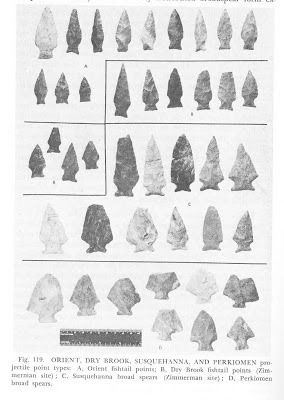 Additional reference is made to this collection as “four stumpy fluted points of black flint” by John Witthoft in Foundations of Pennsylvania Prehistory. Excavations conducted at 36PO4 for a major pipeline project found evidence of a short-term campsite from the late Middle Woodland period. This mixed assemblage of artifacts includes cord marked pottery, chipped stone and one Adena projectile point. The archaeologists noted that the absence of primary and secondary flake debitage indicates that tools were being resharpened as opposed to being made at this location. Flaked stone material recovered included jasper (1) and local cherts (15). Additional archaeological testing for various highway, water and sewer projects and pipeline projects have produced little evidence of occupation beyond short term camps. Lithic materials recovered have consistently been local cherts, jasper, and quartz. Since the county is sparsely populated there have been fewer projects requiring archaeological investigations, thus fewer sites are found, investigated and recorded. As mentioned previously, the cold temperatures and short growing season of the region may have factored into the level of occupation. A research project conducted in 1986 by William Roberts examined the growing season of corn in Hebron Township, Potter County. Roberts compared “flour corn” Zea mays amylacea which takes 130 days to mature, to Zea mays indurate “flint corn” which matures in 100 days. His observation of the frost patterns and growing season prompted him to research why hilltop fields might escape frost damage while low garden areas were destroyed by frost. Roberts recorded temperatures at four locations for the growing season in mixed settings including twos hilltop archaeological sites. Elevations ranged from 2,500’ to 1800’ ft and covered the period from April 15 to October 10. The results have important implications regarding site selection and use during the Woodland period. Temperature inversion as Roberts termed the variation in frost patterns is addressed as “Air at lower temperatures is heavier than air at higher temperatures. Cold air consequently endeavors to push itself under warm air. The result, if opportunity permits, is a circulation of different air bodies until equilibrium is obtained. Cold air from the high ground flows to the lower places and is replaced by warmer air from above. This process works best on calm nights where air pressure is high and and the sky is clear. This allows for “cold islands” cold lakes” or “frost holes” or whatever local term may be applied. 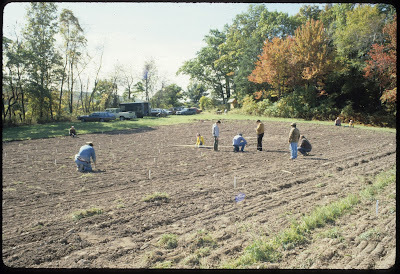 Roberts research examined the feasibility of native peoples growing corn here during the Late Woodland and concluded that the poor soils and cool temperatures (avg. daily temp 46.1) would likely have restricted the crop to flint corn. Roberts further compared corn production of Huron maize horticulture with Iroquois practices. Huron produced single crops of two maize varieties a flour and a flint corn allowing for the possibility for crop failure. Roberts concluded that hilltop forts and adjacent cornfields may warrant additional examination in better understand their relationship to Native American settlement patterns. By the time Ole Bornemann Bull, the famous Norwegian violinist who toured the United States purchased land in 1852, the native population had moved out of the county. Ole Bull attempted to develop a series of Norwegian settlements and assisted in financing many of those who came to Potter County. Transportation into the area was difficult and the lack of funds forced Bull to return to violin performance to raise money. Restrictions placed on the land that Bull had purchased allowed for use of only steep hillside lands covered in rich pine forests. Unfortunately the lumber boom occurred after Bull and the other Norwegians had given up hope and moved from the area. Today, visitors can enjoy the beautiful scenery at Ole Bull State Park. 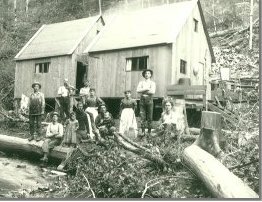 The lumber industry and the boom that would greatly increase the population also wiped out the “black forest” and left hilltops barren due to uncontrolled clear-cutting. Today the Pennsylvania Lumber Museum located in Galeton offers visitors an opportunity to view an early logging camp and equipment employed in the lumber industry. We hope you have enjoyed this tour of the archaeological heritage of Potter County and you will seek out the resources listed here to learn more about your county and the important role archaeology provides in understanding our heritage. 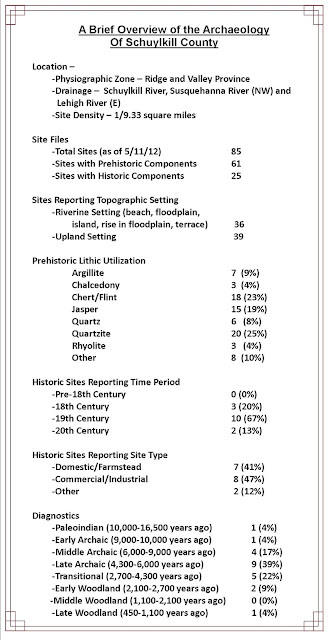 Foundations of Pennsylvania Prehistory, Anthropological Series of the Pennsylvania Historical and Museum Commission, Number 1. Harrisburg,1971. 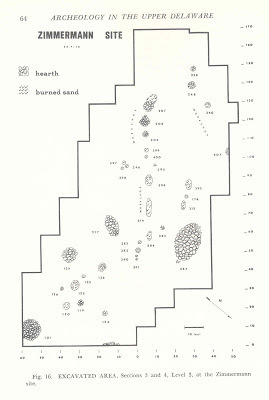 Frost Patterns and Their Implications for Aboriginal Settlement in Potter County, Pennsylvania, Unpublished Master’s Thesis, Pennsylvania State University, Anthroplogy,1988, housed in Section of Archaeology at The State Museum of Pennsylvania. A Cultural Resources Survey of the Proposed Transcontinental Gas Pipe Line Corporation Expansion of the Wharton Lateral Extension Natural Gas Pipeline, Potter County, Pennsylvania. Unpublished Manuscript, Section of Archaeology. This week we are taking a break from our travels by county through the archaeological heritage of Pennsylvania to recognize a special individual - Doris Freyermuth. Doris is a lifelong member of the Forks of the Delaware, Chapter 14, of the Society for Pennsylvania Archaeology (SPA). Over a span of 50 years, she has participated in several significant archaeological excavations and she has also amassed a large collection of her own. We are honoring her at this particular time for her diligent care and recordation of her archaeological collection and on the occasion of this collection being donated to the State Museum of Pennsylvania. The other people who played important roles for this collection are Doris’s husband Benni and their daughter, Karen. Without their love, support and understanding of their wife and mother, Doris wouldn’t have been able to pursue her passion for archaeology. 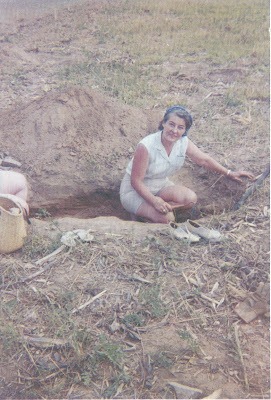 Members of Chapter 14 were “family” to Doris for many years and she delights in sharing the stories of their excavations. On a recent visit with Doris she shared the story of her first excavation in 1962 under the guidance of Earl P. Williams. 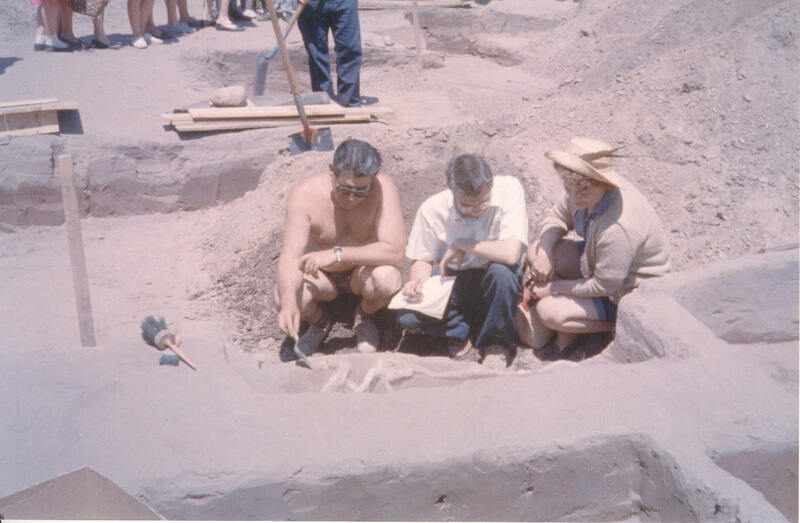 She and Benni along with Elinore Fehr, William Strohmeier, John Kulac and others spent two months excavating at 36Nm1, the Michaels Farm site with additional guidance from John Witthoft, archaeologist at the State Museum. Every artifact was carefully recorded and cataloged, insuring that all of the provenience information was retained. Maps were drawn, measurements taken and the site was recorded in the Pennsylvania Archaeological Site Survey (PASS) files. 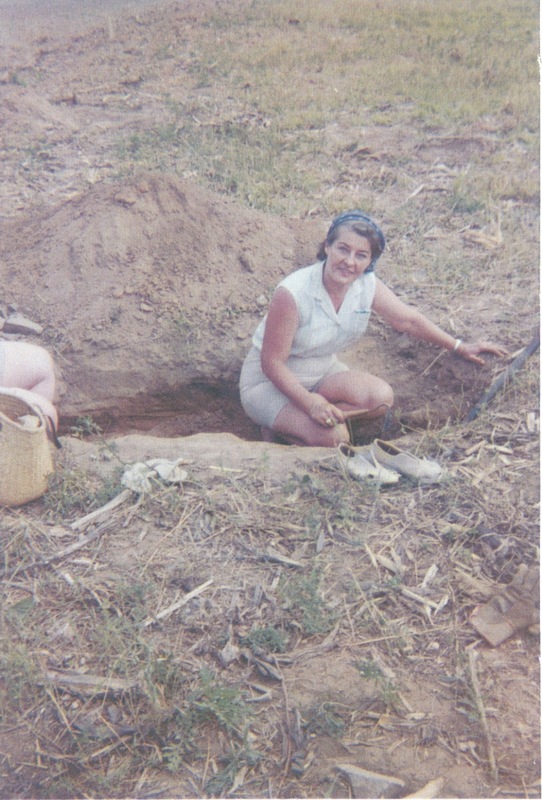 This excavation was conducted at a very professional level and it was this early experience that laid the ground work for Doris and Benni’s collection. They realized that mapping and recording information was the heart of archaeological research. In the fall of 1962, Bethlehem Steel leased five acres of land for a sand removal operation. Thankfully, Bill Strohmeier a member of the Chapter happened upon these activities and with Bethlehem Steel’s permission was able to organize an excavation with other chapter members. Some of these chapter members included Virginia Lopresti, Elmer Erb and Lou Farina who have also donated their collections to the State Museum. Between 1963 and 1967, Chapter 14 excavated at the Overpeck site (36Bu5) along the Delaware River. 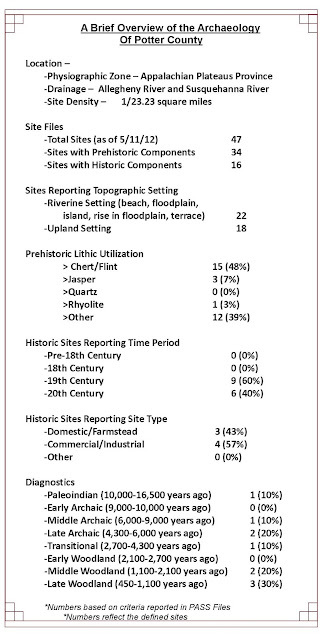 This is a very significant, stratified, multi-component site and the type site for Overpeck pottery. 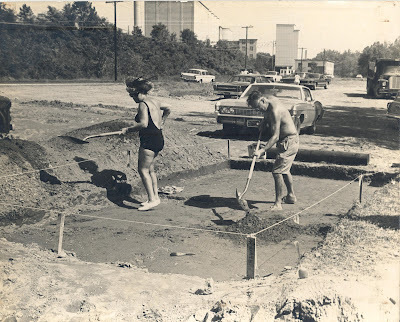 Previous posts on this blog site can be accessed for additional information on the Overpeck site and in the journal Pennsylvania Archaeologist, Vol.50, Number 3, September 1980. 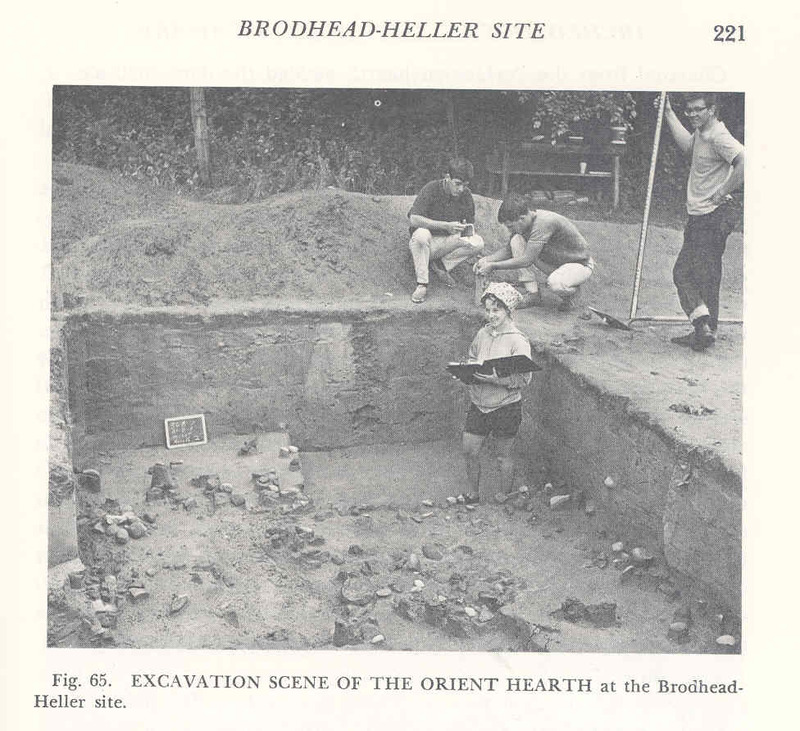 Members of Chapter 14 worked with John Witthoft, Lafayette College staff and other professionals to insure that the site was properly excavated, recorded and interpreted. Penny Lippencott served as the field director and oversaw the daily activities of the excavation. They set a high standard that continued when the group excavated their next major project at Sandts Eddy (36Nm12). 36Nm12 was initially investigated in 1969 as a salvage archaeology project by Chapter 14. 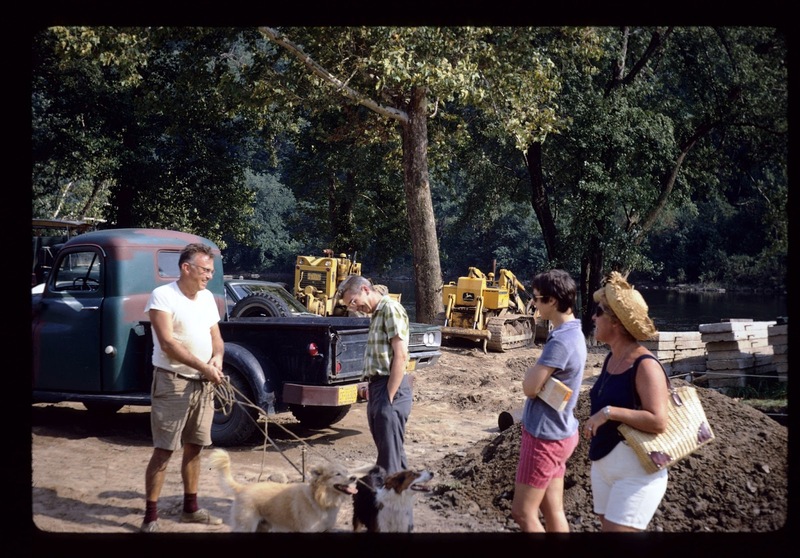 Construction of a boat ramp along the Delaware River by the Pennsylvania Fish Commission had drawn the attention of Doris and Elinor Fehr. They recognized the potential for an archaeological site at this location. They observed stains in the soil but not many artifacts. However, with the assistance of other members of the chapter, investigations were conducted over several weekends. The discovery of Transitional period artifacts and a series of potential post-molds prompted a call to Barry Kent, State Archaeologist at the State Museum. This turned out to be a major Transitional period occupation, with numerous projectile points, fire-cracked-rock features and five caches of bifaces. A report was prepared by the chapter (Fehr et al. (1971) and included comments by Barry Kent. Kent summarized the question of the ‘post-molds” by stating that “no positive conclusions can be drawn with regard to the validity of the postmold-like stains, the configurations which they seem to create, and their relationship to the Transitional period occupation of the site. He goes on to state that “these postmold-like features and the configuration created by their distributions cannot be interpreted as house patterns”. Chapter 14’s research at the Sandts Eddy site was instrumental in leading to additional excavation when, in 1985, Transcontinental Gas Pipe Line Corporation planned a major gas pipe line through the site. A series of excavation were conducted to test the site and mitigate the impacts of construction. These produced very significant data but from a much earlier time period dating to over 9000 years ago. At over eight feet in depth, a single hearth was uncovered. This was associated with a small assemblage of tools, including a bifurcate projectile point, all probably representing a single nuclear family occupation. The lesson here is the importance of recording sites and sharing information with the archaeological community. The important role Chapter 14 assumed as archaeologists and preservationists demonstrates how effective chapters of the Society for Pennsylvania Archaeology can be in helping the Pennsylvania Historical and Museum Commission (PHMC) record sites and the data they contain. It is apparent in the collections donated by Doris and other chapter members that they understand the true value of an archaeological site is in the analysis and interpretation that occurs which helps us to better understand how people lived in the past. Doris and Benni’s collection represents their lifelong love for the science of archaeology. Over the years, Doris continued to walk fields and collect artifacts. Benni carefully made over 40 wooden “books” or boxes to house her collection. 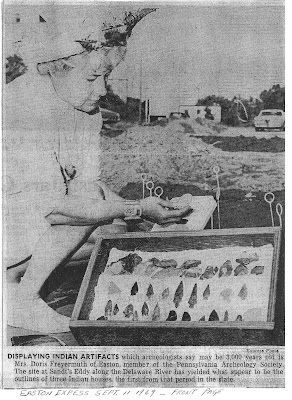 Doris donated over seven hundred projectile points in these books, each organized by site and assigned a number from the PASS files. Each book has one or more 3x5 card describing the artifacts and the site. We couldn’t ask for better documentation from surface sites. Doris told us that there were a few artifacts that she had saved for herself and one special clear quartz projectile point that she had saved for Benni- his favorite from the collection. Doris has similar “books” of sites located in New Jersey which will be donated in the next few weeks to their State Museum. Preservation of these collections is important to Doris and Benni, this is their legacy and one to be proud of. Thank you Doris and Benni from the State Museum and the archaeological community! You are outstanding archaeologists and excellent role models for others. 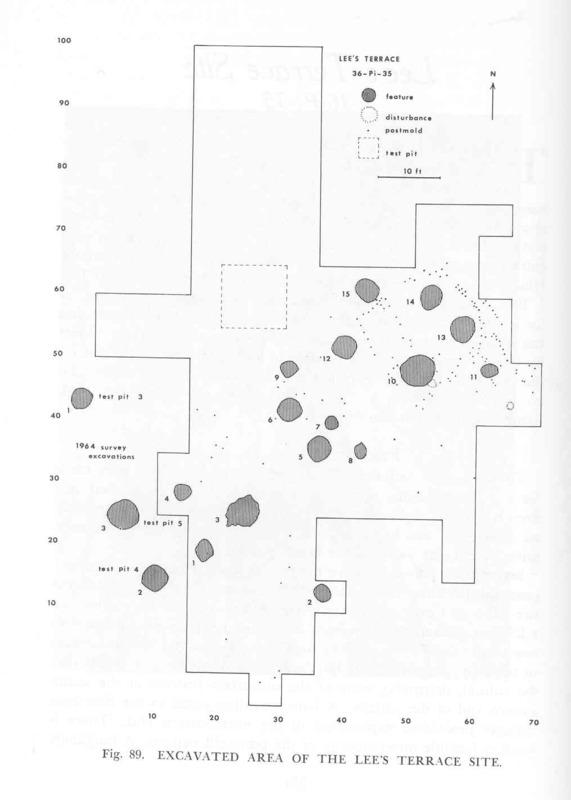 The Overpeck Site (36Bu5) Pennsylvania Archaeologist, Vol. 50 No. 3, September 1980. Cultural Resources Investigation of Transcontinental Gas Pipe Line Corp. 6.79 Mile Leidy Natural Gas Pipeline Extension, MP29.51-MP36.30, Warren Co., NJ & Northampton County, PA. April 1991. Arch. Data Recovery for Transcontinental Gas Pipe Line Corp.'s 6.79 Leidy Natural Gas Pipeline Expansion. February 1996. This week our journey by county through the archaeology of Pennsylvania takes us to eastern Pennsylvania and Pike County. This county is situated in the Appalachian Low Plateau section of the Appalachian Plateaus Physiographic Province. The Delaware River is the major drainage and it forms the eastern boundary of the county. The major streams are Shohola Creek and Bushkill Creek. The region is characterized by many bogs and glacial lakes. Lake Wallenpaupack is the largest lake in the region. It began as a small glacial lake but was greatly enlarged as part of a hydroelectric and flood control project. Beginning as early as the 1880’s, the region became a tourist destination. 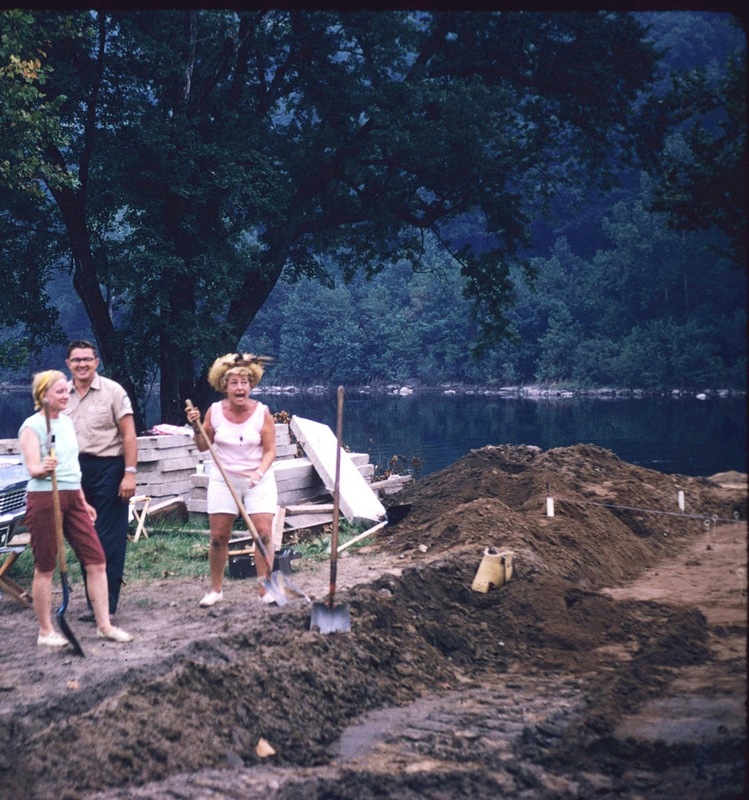 By the early 1950’s, there were many summer camps and resort hotels along the lakes and the Delaware River. Up until the 1980’s, the region was characterized by dairy/general farms and was sparsely populated. With improvements to the regional interstate highway system, the population has greatly increased although many commute for work in the Allentown or New York metropolitan area. The site density is below average at 1 site per 2.12 square miles. Approximately 80% of the sites are located along the Delaware River and Lake Wallenpaupack. Based on a few intensive surveys in upland areas using close interval shovel test pit testing, very small sites have been located around upland swamps (Perazio 2008). Although difficult to discover, these are probably much more common than what is listed in the Pennsylvania Archaeological Site Survey files. The most common lithic resources for the production of stone tools are chert, jasper and argillite. Chert is locally available in several different rock formations such as the Buttermilk Falls formation. However, there is only one chert quarry recorded in the county. The other two lithic resources are not locally available and these are both located 60 miles to the south. Jasper is found in the Hardyston formation west of the Allentown area and argillite is found in the Lockatong formation east of Doylestown. Stratagraphically above the Dry Brook occupation was a level that produced Early and Middle Woodland components. The Late Woodland component was large and produced a large number of pits containing a variety of pottery types including Owasco, Chance and Munsee types. Beginning with the Chance phase, the pits included charred corn, cobs, husks and charred grass linings. Unfortunately, the site did not produce any well defined postmold patterns indicating the size or nature of dwellings. We are fortunate that Mr. Werner donated the Zimmermann collection to the State Museum where it can be studied for generations to come. The largest archaeological survey conducted in the county occurred between 1965 and the late 1970s in preparation for the Tock’s Island Reservoir project. Although the dam was never build due to engineering problems, scores of archaeological sites were recorded and over 20 were tested on both the Pennsylvania and New Jersey sides of the river including 10 sites in Pike County. Many of these sites are now part of the Tocks Island Recreation Area and protected by the National Park Service. 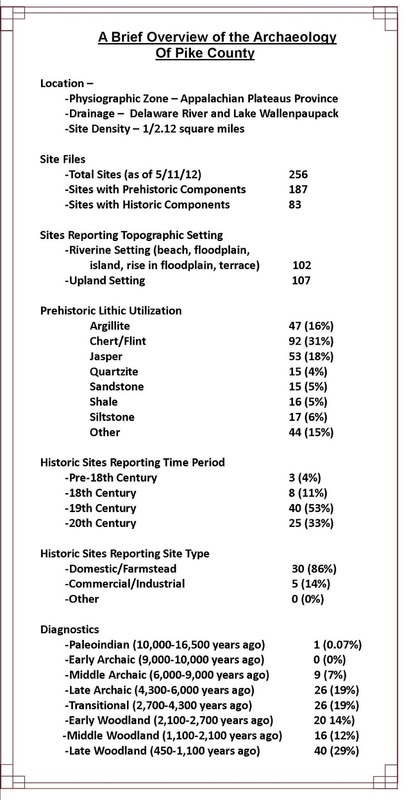 W. Fred Kinsey, III produced a comprehensive report on the majority of these investigations in book titled Archaeology in the Upper Delaware River Valley (1972). The Faucett site (36Pi13A) and the Brodhead-Heller site (36Pi7) are probably the best stratified and they generally support and enhance the cultural sequence recovered at the Zimmermann site. Faucett produced multiple Late Woodland components including Owasco and Tribal Series pottery. The Middle Woodland, Bushkill component, was well defined at Faucett along with the Early Woodland Meadowood component. More recent research with these components document the shift to domesticated plants but not corn agriculture. The Transitional period was characterized by Orient fishtail points and Perkiomen broadspears. 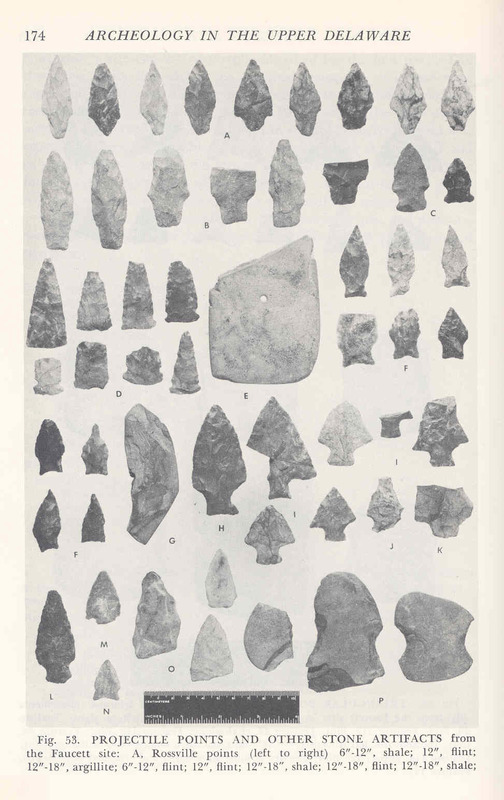 The Late Archaic component was characterized by a small number of Lackawaxen stemmed points and included a cache of five adze blanks. The Brodhead-Heller site produced what seemed to be intermittent Late Woodland and Middle Woodland occupations andt little pottery. The major occupations at this site were Transitional and Late Archaic in age. There were numbers of both Orient and Dry Brook projectile points in the same level representing the Fishtail phase. This association suggests that these types overlap in time and are not chronologically distinctive. There were 23 Perkiomen broadspears representing a large and intensive broadspear occupation. 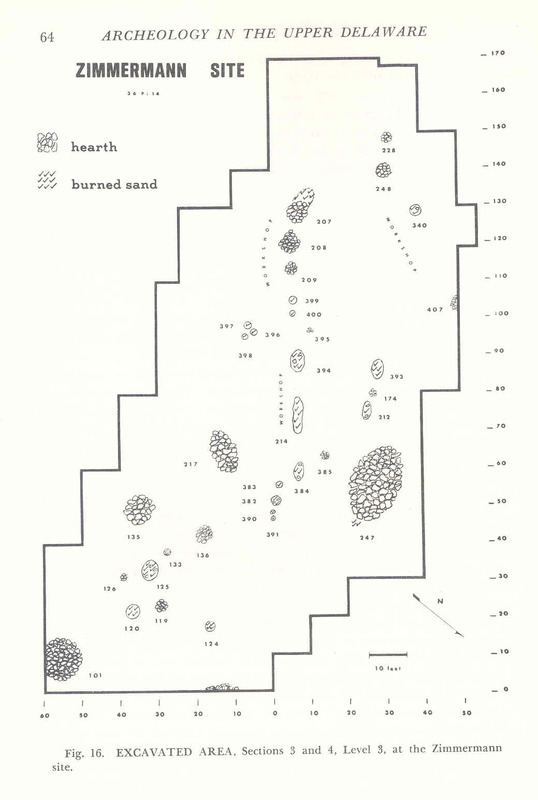 Both the Fishtail and Broadspear phases were associated with large fire-cracked-rock hearths/stone boiling dumps. Unfortunately, these did not contain any organic material so we do not know what food was being processed. 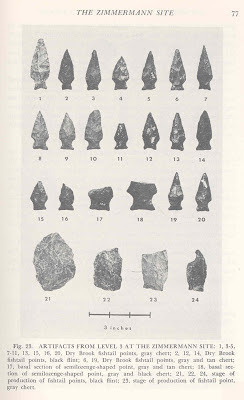 The Late Archaic component was found at a depth of over four feet and produced both Piedmont stemmed and Brewerton notched projectile points and included an unfinished atlatl weight. Finally, pits and postmolds were extremely common at all of the sites excavated in the floodplain of the Upper Delaware River but defined house patterns were very rare. The Lee’s Terrace site (36Pi35) produced a possible example of a longhouse and represents one of the few examples that exist for this house type anywhere in the Delaware Valley. The Upper Delaware Valley is probably one of the best laboratories for the study of Transitional, Early and Middle Woodland adaptations in Pennsylvania. This is a significant period in cultural evolution representing the shift from a foraging adaptation to a horticultural adaptation. The Transitional period also represents significant changes in social organization. The Upper Delaware also represents an extremely interesting study area for Late Woodland adaptations. Outside of the Upper Delaware valley in the Middle Atlantic region there is extensive evidence for settled farmsteads and concentrated populations living in agricultural villages. Although there is extensive evidence for corn agriculture in the Upper Delaware, the evidence for villages is rare. The question is have the villages not been found or do they even exist? We hope you have enjoyed this journey through the archaeological heritage of Pike County and that you will seek additional reading in the references provided below. 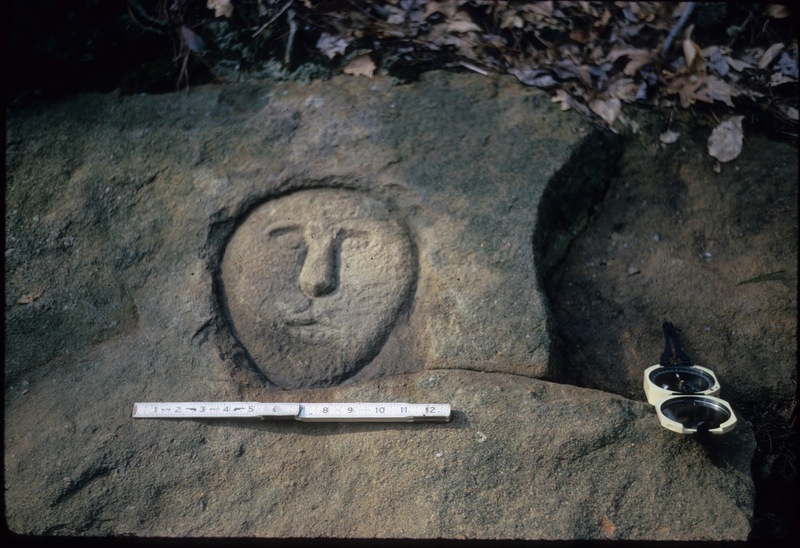 Understanding and exploring our archaeological heritage is pivotal to our understanding of human behavior and our ability to change and adapt over time - just as the peoples of Pike County have done for thousands of years. 1972 Archaeology in the Upper Delaware Valley. The Pennsylvania Historical and Museum Commission, Anthropological Series Number 2, Harrisburg. 2008 In small Things Frequently Overlooked – Prehistoric Site in the Pocono Uplands. In Small Lithic Sites in the Northeast. Edited by Christina B. Rieth. pp 89-100, New York State Museum. 1972 The Zimmermann Site. In Archaeology in the Upper Delaware Valley by W. Fred Kinsey. pp. 55-130, The Pennsylvania Historical and Museum Commission, Anthropological Series Number 2, Harrisburg.